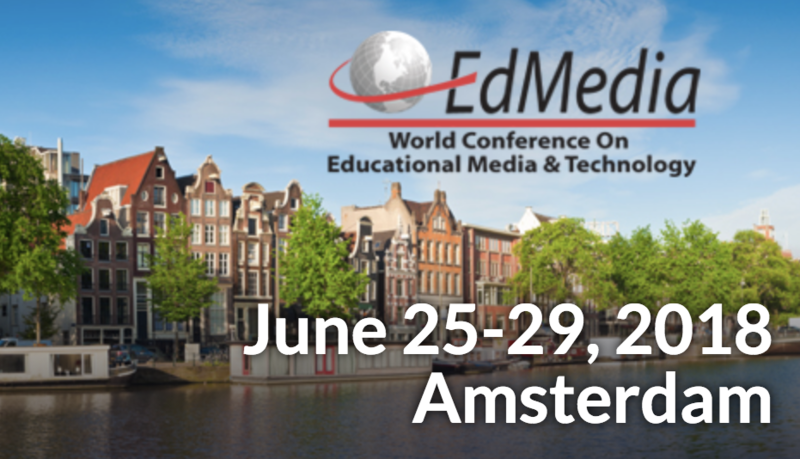 Alexander Mikroyannidis presented the latest work on educational applications of the Blockchain at the World Conference on Educational Media and Technology (EdMedia). The event was held in Amsterdam on June 25-29. Alexander presented a paper outlining a learner-centred approach for lifelong learning powered by the Blockchain. The paper explores the different aspects of lifelong learning and describes an ecosystem that places the learner at the centre of the learning process and its associated data. More specifically, the paper outlines the ways that ePortfolios, accreditation and tutoring can evolve with the use of the Blockchain and discusses the various benefits that this evolution bears for lifelong learners. Alexander’s presentation was very well attended and received by conference participants. Alexander also demonstrated the SlideWiki platform during a dedicated session. The SlideWiki platform employs crowdsourcing methods in order to support the authoring, sharing, reusing and remixing of open courseware. The SlideWiki project is introducing the SlideWiki platform to different communities of educators and learners by performing a wide range of trials covering different levels of education (i.e. from secondary to higher education) and different types of learning (i.e. formal learning, informal learning, vocational learning). EdMedia is an international conference organised by the Association for the Advancement of Computing in Education (AACE). This annual conference has been held since 1987 and spans all disciplines and levels of education attracting researchers and practitioners in the field from more than 70 countries. It offers a forum for the discussion and exchange of research, development, and applications on all topics related to Innovation and Education.